J.M. Maharoof, from Ibbagamuwa in Kurunegala is a survivor of a deadly bus accident that claimed 21 lives in 2003. The packed SLTB bus in which he was travelling crashed into a tree, killing 11 on the spot – more deaths followed from among the 80 other casualties. Mr. Maharoof sustained severe injuries to his head and face and had to undergo a number of operations at the Kurunegala Teaching Hospital. 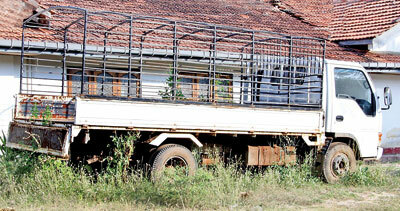 The only suspect in the case is the driver, H.M. Premaratne. The case is being heard by the Kurunegala High Court. With no proper legal protection covering third-party accident cases, victims of accidents involving state vehicles are forced to wait for years to gain compensation. Such accidents happen continuously – earlier this year, a 65 year-old man was killed when an SLTB bus veered off the road in Inginiyagala and ran over him. Last year, 14 passengers were injured when a SLTB bus from Colombo to Hatton fell down a precipice at Watawala after a tyre blew up. In the same year, more than 20 passengers were injured when an SLTB bus collided with a private luxury bus in Warakapola; 22 people were injured in Bagawanthalawa when an SLTB bus they were traveling in skidded off the road, and two school students were injured in an accident involving a ministerial convoy in Pannipitiya. 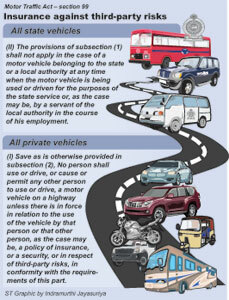 A provision of the Motor Traffic Act allows motor vehicles belonging to state or a local authority to be used or driven without any insurance cover. Nevertheless, a circular of the Public Finance Department states that all government and semi-government institutes should obtain general insurance, which includes motor insurance, and that at the discretion of institute heads, insurance coverage could be selected from the National Insurance Trust Fund (NITF) and Sri Lanka Insurance Corporation Ltd (SLIC). The Sunday Times learns that despite the circular, some vehicles belonging to state institutes have not been insured in any way. A senior official attached to the traffic police said some police vehicles had not been insured. Insurance Ombudsman Dr Wickrema Weerasooria said that even though state vehicles were not obliged to take out insurance under the Motor Traffic Act, under the State Liability in Delict statute passed in 1968 the State was liable to pay out compensation if a third party suffered damage or losses from an accident caused by a state-owned vehicle. He said the circular requesting state institutions to insure their vehicles under a third party policy had not reached every department and therefore some had not insured their vehicles. Dr Weerasooria said some compensation cases stretch for 10-15 years according to the severity of the accident. “If state vehicles obtain third-party insurance, compensation can be decided even before the matter goes to court,” he said. “If the third party is not satisfied with the compensation given by the court or the insurance company the third party can consult the Insurance Ombudsman to negotiate with the state or the insurance company for an unbiased satisfactory settlement between parties.” Unresolved cases could be brought before the Insurance Ombudsman. According to the Sri Lanka Transport Board’s Official Vehicles Division all board vehicles – including all SLTB buses – are insured. The Sunday Times found that the Registrar of Motor Vehicles (RMV), which collects and compiles statistics of vehicles in the country, does not know how many state-owned vehicles exist. Motor Traffic Commissioner-General S.H. Harischandra advised his officers to start collecting details of state vehicles following an inquiry from this paper. “It had been the common belief that a state employee is honest and commits no crime against its public. But following several accident reports we have decided to bring in the amendments,” Mr Harischandra said. The amendments to the Act are currently with the Legal Draftsman’s Department. Mr Harischandra said state drivers who commit an offence would be judged according to the same rules as other state employees and legal action would be taken according to the evidence before the courts. In such cases the driver would face an inquiry conducted by his department and further action will be taken by a disciplinary committee. Asked about military vehicles, the Commissioner-General said the RMV did not have any powers or records, and did not issue the relevant driving licences. Acting Military spokesman Brigadier Dushan Rajaguru said that military vehicles could not be insured by any insurance company owing to the nature of the duty. “The licences of drivers and vehicles are handled by the military, and if a driver commits an offence then legal action will be taken against the driver. The relevant department will pay compensation and damages caused to the military vehicle by the driver. Repairs will be done through fund allocations,” he said.